Henry Nelson O'Neil (1817-1880), Painter. Artist of 1 portrait, Sitter in 3 portraits. Henry Nelson O'Neil (1817-1880), Painter. Sitter in 3 portraits, Artist of 1 portrait. Admiral Seymour. Sitter in 1 portrait. Thyra, Crown Princess of Hanover and Duchess of Cumberland and Teviotdale (1853-1933), Wife of Ernest Augustus, Crown Prince of Hanover and 3rd Duke of Cumberland and Teviotdale; daughter of Christian IX, King of Denmark; sister of Queen Alexandra. Sitter in 16 portraits. Prince Waldemar of Denmark (1858-1939), Naval officer; son of Christian IX, King of Denmark; brother of Queen Alexandra. Sitter in 11 portraits. This group of over fifty figures commemorates the arrival in England of Princess Alexandra of Denmark for her marriage to the then Prince of Wales, later Edward VII. It shows the Prince leading his fiancee along the Terrace Pier at Gravesend, after her disembarkation from the royal yacht Victoria and Albert. 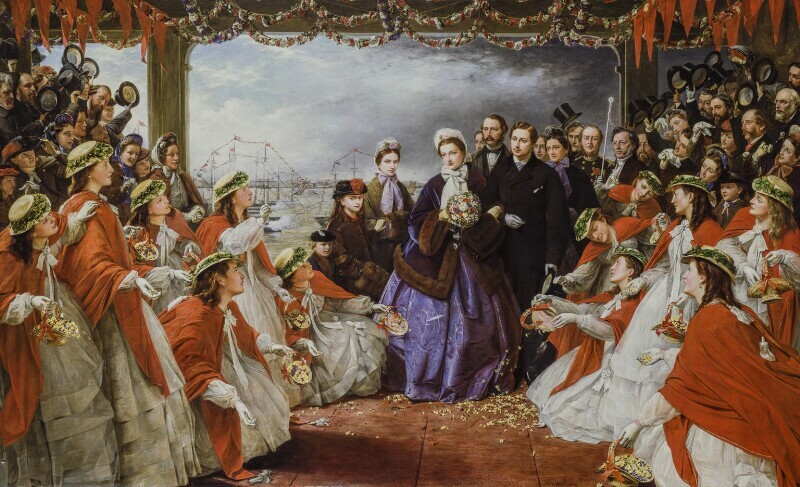 The Prince and Princess are accompanied by her parents, the future King and Queen of Denmark (who stand immediately behind them) and other members of the Danish royal family, officials and dignitaries, and, as the Illustrated London News reported, a 'bevy of pretty maids, who, ranged on each side of the pier, awaited, with dainty little baskets filled with spring flowers, the arrival of the Princess, to scatter these, Nature's jewels, at the feet of the Royal lady'.